Andrew Lemon wrote the three-volume History of Australian Thoroughbred Racing (Hardie Grant Books), joint winner of the biennial Australian Society for Sports History book award. A past president of the Royal Historical Society of Victoria, in 2012 he held a John H. Daniels Research Fellowship at the National Sporting Library and Museum in Virginia, USA. 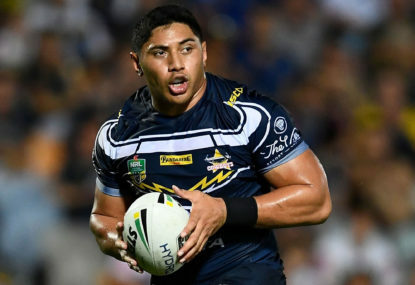 North Queensland powerhouse Jason Taumalolo insists his huge performance against St George Illawarra is just the start of things to come this season. 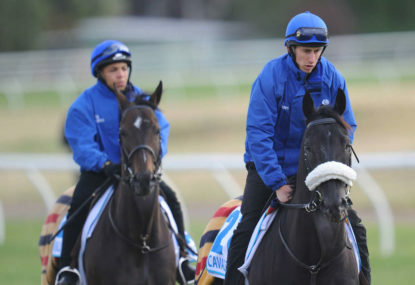 The last time I backed Cavalryman to win the Melbourne Cup was in 2012. Ridden by everyone’s favourite international jockey Frankie Dettori he duly finished 12th to Green Moon at odds of 30/1. Two out of every three runnings of the W.S. Cox Plate have been won by champions. Since we’ve already forgotten the names of the last three winners, it must be more than time for a champion to win on Saturday. There are three ways how not to lose on Saturday. You know the first two. A: Don’t have a bet. Something unexpected is bound to win. 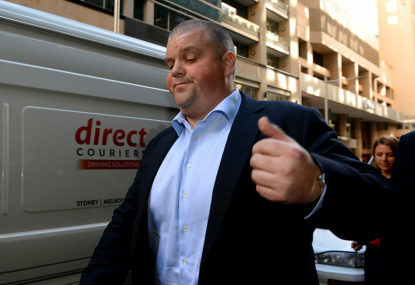 Nathan Tinkler’s fire sale: Who got burnt? Out, out, out they went, at crazy discount prices. Sounded like a TV commercial for Harvey Norman. Was it 50 months interest free, nought per cent interest, no deposit? This has been a good news week in Australian racing. Black Caviar had her first foal. James Cummings won his first Group 1 in partnership with Grandpa Bart: a Hallowed Crown indeed. 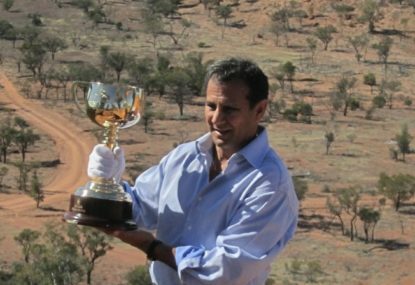 If the Melbourne Cup is the heart of Australian racing, then the soul resides in the country. Without a soul, even a heart as big as Phar Lap’s is just a relic in a big glass jar. Star Rolling won the big race at Caulfield last Saturday at the nice price of $10. Most experts forgot to tell you he was among the chances. Were there signs? Season’s end, a new start. It’s time to give credit to top jockeys of the racing year that finished on July 31. But we all know that statistics lie, they cheat, they withhold the full truth. You may honour Dunaden as a star of the Australian turf, with his glorious wins in the 2011 Melbourne Cup and 2012 Caulfield Cup. French racing fans know that he is theirs, ‘un globe-trotter’, world traveller and world beater. Yes, there is a link between the Melbourne Cup and last week’s events at Royal Ascot and Wimbledon. Stick with me and I’ll explain. Ok, it’s a bit less glamorous than Brazil, but on Sunday jockey Steven Pateman completed his seventh jumps win for the season, a significant accomplishment for a first-class Australian sportsman. Forget those Group 1 races in Brisbane. The best race and the best ride in Australia on Saturday were in the $100,000 Stayers Cup at Royal Randwick. Out he goes. At least no-one can blame me for losing their money on Cavalryman, or Sea Moon for that matter. So the selection now is Fawkner from Lucia Valentina and Admire Ratki. Protectionist for 4th, Willing Foe my sentimental roughie. Good luck all. Holding my breath for Cavalryman. If he’s out it’s hard to tip past the favourites. Fawkner nearly broke the record in the Cox Plate and his 2012 Caulfield Cup win was three seconds faster than this year’s CC (where both Rakti and Lucia were admittedly impressive). Fawkner loves Flemington and Nicholas Hall has the incentive to emulate his father Greg on Subzero. If you think Lloyd Williams has had his turn already, couldn’t agree more, but refer to article above re Turns. 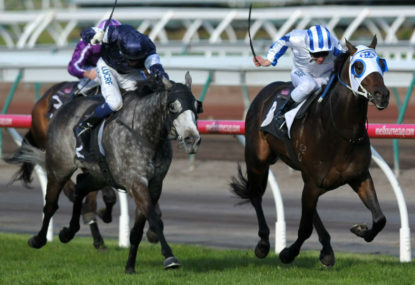 Team deserves credit for placing Fawkner so well. All true. Rakti was super admirable at Caulfield and is logical favourite. I worry that the race was slow, not that he set the pace. But don’t forget Red Cadeaux (2nd) was 60-1 in last year’s Melb Cup and (2nd) 50-1 when pixelled out in 2011, Green Moon (1st) 20-1 in 2012, Viewed (1st) 40-1 in 2009. When Fiorente ran second to Green Moon he paid $11.20 a place. Not all the professional punters were on these ones. So there is hope for a big run from any sentimental favourite of your own. As discussed in my posting last week, Ryan Moore may get lots of good chances but he is an astonishingly good rider and we were privileged to see his maiden performance at MV. As he pointed out in a post-race interviews, Moonee Valley is not the smallest track in the world (the Roodee at Chester near Liverpool for example is the same circumferance) so he clearly knew exactly what he was doing throughout the race. I agree with you that Nick Hall gave Fawkner a dream run. The horse relaxed into a good spot and did everything asked of him – a good pointer to the Melbourne Cup. But Moore’s judgement was impeccable. Ryan Moore: gun jockey or lucky to be on the best horse? Well we were on the money this time. Ryan Moore is certainly a champion. Adelaide now has the scope to be a champion, in the way I was describing, if they only let him be a racehorse before they turn him into fields of cotton wool, so let’s look forward to big things in 2015. Reading my words carefully in the article, I said “I think I’d include Fields of Omagh, with two wins, as a champion”, and that’s a fair call given the career and five Cox Plate starts: we loved him at the end. I said Ocean Park, like Shamus Award and Pinker Pinker, was “all very well”, but the careers as racing stars were too short, and there are no prizes for could-have-been-anything. If Ocean Park sires a Cox Plate winner, as Rubiton sired Fields of Omagh, I will happily promote him. I stand corrected, thanks and apologies… the symbol (IRE) after his name should have been a clue, like the words ‘Aidan O’Brien’ and ‘Ballydoyle’. But I think at least Ryan Moore was born in England. Ah yes, but it wouldn’t be the Cox Plate any more – just the Mackinnon Stakes a week early. Part of the challenge of the Cox Plate is for horses and jockeys to master the Valley, and there’s nothing more exciting than when champions do just that. If and when that goes, the magic of the Cox Plate will be gone for ever. Our racecourses also ought to be our city open spaces for everyone. Which horse would you prefer in your stable? One Group 2 win and one Group 2 placed. Raced (but failed) in the big races in Japan, Dubai and Hong Kong. $2.5 million plus NZ$382,463 in earnings. Good judgement Brent Ford: Rising Romance and especially her jockey did you proud and nearly stole the race. Zac Purton did a great job to win on Admire Rakti who didn’t seem to mind being top weight. My pick Brambles ran a close and brave fourth, backed each way of course. What a difference a day makes! Dandino scratched. Gris Caro scratched. Bande scratched. Internationals in disarray. Jockeys Joao Moreira and Christophe Lemaire won’t be riding. Luke Nolen switches to his preference (and mine), Brambles. Ben Melham gets the lucky ride on Lidari as a result, Craig Williams transfers not to Big Memory but – according to Racing Victoria – to the second emergency, Araldo trained by Mike Maroney. Corey Brown rides Big Memory. Unchain My Heart gets a run after all for the Hayes crew, with Stephen Baster getting the ride. And it’s not even raining. Conditions will be perfect. I’m breathless already. Thanks for the update Tim. Come on Brambles. I wrote my piece yesterday before the scratchings, but I will let it stand unedited as a testament to how I saw the race when the field was released. Then we can all have a good laugh after the event. A lovely comment. I agree. True. So too do football, cricket, the stockmarket, boxing, cycling, rock music, art, religion… You have to make the choice which side you want to be on. There are angels and revelations in racing, believe me. Interesting comments. As Brent Ford says, the article simply asks racing fans not to take the annual premiership winning statistics at face value. Look beyond the obvious. Having said that, para 4 says exactly what I mean – you can’t be top if you’re no good. I salute the winners, I put in a good word for James McDonald who made it on his own ability in Sydney, and I confirmed that Damien Oliver is a legend. But statistics are slippery and can distract us from recognising the talents of those who ride under the many disadvantages I mention. 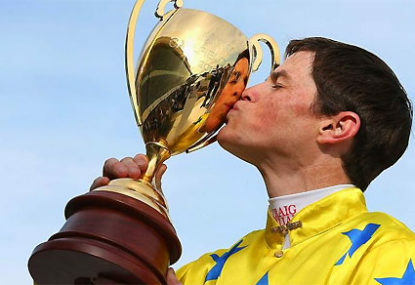 By the way, I have always thought Luke Nolen deserved more credit than he sometimes gets for his rides on Black Caviar. He promoted the fiction that he was just the bloke on board. Miscalculation nearly cost him the famous race at Royal Ascot but I admired his coolness under extreme pressure with all the racing world watching. It was consummate horsemanship by Nolen and a real bond with Black Caviar that got the mare back into overdrive to make a winning lunge just as she was about to be beaten. And I certrainly don’t discount strike rate. It’s a very good guide to top jockeys. The point is that the better jockeys more often have the luxury of picking and choosing their rides. It can conceal the fact that a bread-and-butter jockey who has to ride many no-hopers can still be a brilliant rider, given a chance. Don’t let them get under your guard. Thanks Luke. My reason for looking at the French websites on the announcement of the retirement of Dunaden was in part to answer this question. The French are as parochial as Australians so when their horses, trainers or jockeys do well over here in the Melbourne Cup – a prestigious international race – it gets sports coverage. Same as when Australian jockeys won the Prix de l’Arc de Triomphe (such as Sellwood, Moore, Pyers, Johnstone) it made news here – but only then. Bart Cummings’s twelfth Cup win with Viewed (2008) earned him a big write up in the official bilingual magazine “Courses et Elevage”. Dunaden’s breeder Count Edouard Decazes spoke fondly of attending the Melbourne Cup as a big event in the 1970s. If you don’t rate the Melbourne Cup highly, I’m told that winning it changes your opinion. Robert Sangster discovered this in 1980. 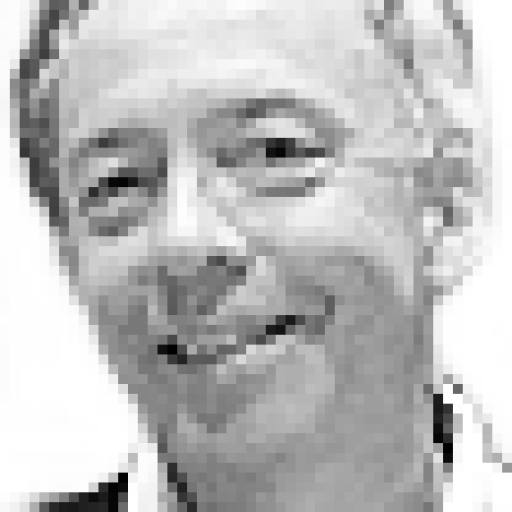 Thanks Tim, my mistake – but actually we’re both wrong! Poseidon won the CC in 1907 after winning the 1906 Melbourne Cup – he also won the 1906 Caulfield Cup. 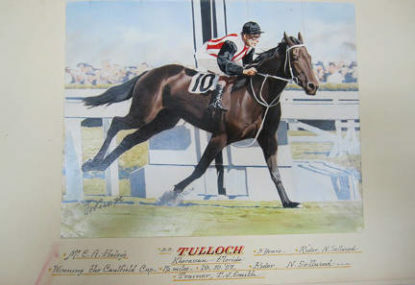 And Skipton who won the MC as a three-year-old went on to win one of the two divisions of the Caulfield Cup when it was run at Flemington in 1943 during the war. (Call myself a racing historian?) Will correct this now in the text. It’s simple. Doug and his brothers help push Australian amateur tennis into international big-time professional tennis in the 1970s. Then Doug gets into racing in a big way and helps cajole the Melbourne Cup into the big-time international horse racing world. Both Australian events depend now on big rewards and recruiting celebrity athletes (four legs or two). 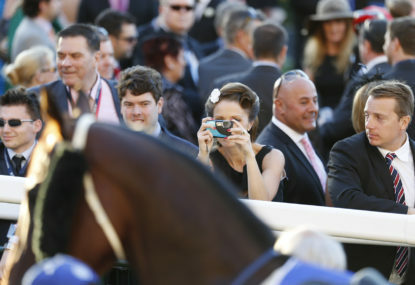 The Ascot Gold Cup is a recruiting event for the Melbourne Cup. Writing about Ascot while writing an obituary for Doug Read and watching Nick at Wimbledon (I can multi-task) made me think about the connections. 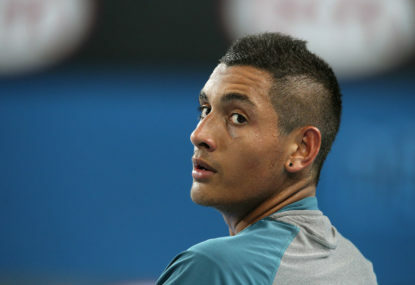 If Australian tennis wasn’t part of the Grand Slam world, the chances of Nick playing at Wimbledon at 19 would be remote. When Doug played at Wimbledon in 1954 at 19 he had to pay. Nick today gets big rewards. So in a very indirect way, Nick owes Doug. Don’t forget you heard it first here on The Roar! (Well, more or less.) After last week’s article, Steven Pateman rode three out of three jumps winners at Warrnambool on Sunday 29 June. Three out of three puts us in mind of Adam Lindsay Gordon and B.R. Smith – not bad company if you look up your history books. Alfred is right, strength is a big part of the equation, along with a touch of elegance. 20,000 races a year. 20,000 winning stories. Multiply by that by the number of stories of ‘why we got beat’. That would be just the start. You are largely missing the point, Mark. It’s not about champion frontrunners, but rather about the spectacle of horses who open up a 20 length-plus break in the running. Punters and the other jockeys don’t know if the horse is bolting, if the rider has gone mad, or if it’s part of a cunning plan. Might And Power’s sensational 7-length win in the 97 Caulfield Cup is one of the all-time great victories, but he did not start going more than a length in front of the rest till they got to the home turn. Then he took off. 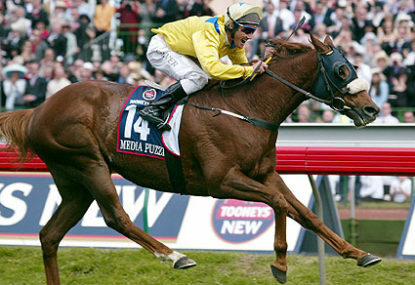 Sunline with her 32 wins was also one of the greats, but never raced beyond the Cox Plate distance of 2040 metres. A pregnant Black Caviar (furthest win 1400m) would have won only the first lap of the 3200 Stayers Cup. Astro is no champ yet, but it was a fine try and a clever ride by a new jockey. In my view the correct odds for all hopefuls this far out from the Melbourne Cup is 1000 to one. Jumps racing: Is there a place for it in Australia? I wrote on Harness Racing and on Coursing (long-forgotten parent of modern ‘speed coursing’ or ‘tin-hare’ greyhound racing) in the ‘Oxford Companion to Australian Sport’ (1992, 1994, 1997) only because the social and political histories of these sports overlap. Otherwise my passion is for the thoroughbreds. 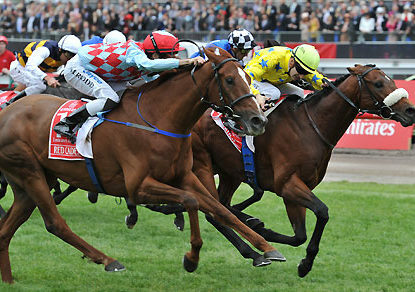 Try www.racingnetwork.com.au – look under FORM AND RESULTS for Race Replay Search. Find Randwick for 7 June, and look for race five.